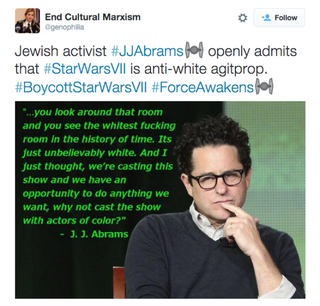 Star Wars: Episode VII—The Force Awakens has a racist troll up in arms because of the diverse cast. A twitter user, who obviously never knew Darth Vader was voiced by a black man or never paid attention to the luxurious waves in Lando Calrissian’s hair, complained that the movie is anti-white. #BoycottStarWarsVII became a trending topic because of a troll with too much time on his hands and obviously nothing better to do. Trolls are gonna troll. It’s the nature of the Internet. I’m quite sure he’s already purchased his ticket for the movie.